I am still an amateur with DNA testing, but I am slowly learning. Since my lasts posts on this subject, I have discovered another very helpful blog: Kitty Cooper’s Blog. She has a brief manual for GEDmatch.com that I wish I had found a long time ago. The truth is, my mom simply doesn’t have a lot of second, third and fourth cousins and her results show matches that are fairly distant, often 9th or 10th cousins, if findable at all. I knew this all along, because even early on using Ancestry.com, I never found any of my great great grandparents in other trees, only, if anything, 3x great grandparents. Even that was rare. So there was no reason to expect that DNA matches would turn much up that was new. I did find that mom matched the early families of Warwick and East Greenwich, Rhode Island, thereby firming up a theory I had about her Andrews line. And I found a third cousin in a Martin line that had been a mystery to me. I have tests on Ancestry DNA and Family Tree DNA. I have also moved all results to GEDmatch. At first GEDmatch seemed like a total mystery to me, but I gradually started trying every feature, and it began to make more sense. One surprising result turned up. I had previously tested a fifth cousin in one of my mom’s mystery lines, trying to find proof of a theory that the person my gg-grandmother Jessie McLeod said was her father, William MacLeod, really was her father, despite some confusing evidence of an adoption. The cousin was not a match for my mom, but actually their statistical likelihood of a match was fairly low, so I couldn’t make much of that. But I tested my mother’s first cousin (I’ll call her my aunt) recently, also a descendant from the McLeod line. She DID match the fifth cousin (in fact, he is her 12th closest match). While looking at that match in the chromosome browser, I could also see tiny matches to my mother in the same spot that had not been strong enough to show as a real match. So I am quite sure that William MacLeod was Jessie’s father or close relative. The spot on chromosome 4 where the group matched. Illustration from GEDmatch.com. I received 3 replies. One said her father was adopted so she had no information. Another said nothing there seemed to match what they knew. A third said it was her husband’s test, and he was mostly Irish, which would match with some of my aunt’s lineage, and the fifth cousin’s. It made me wonder if by some crazy coincidence the fifth cousin matches my aunt through her Irish side, but on the other hand, mom and I both match some smaller spots of that match so I am hoping this is not a coincidence. It is hard to get people to answer DNA emails, usually, I think, because they don’t know the thing you are asking about. Thanks to all the special sales out there, more people are testing all the time. I’m not sure if that’s good or bad, because many have no trees on the testing sites. I hear you can often find their tree out there somewhere, but this takes a lot of searching, especially when you consider that their version of their tree is not guaranteed to be correct, by any means. Of course I also ran tests to find those who matched my aunt AND my mom, on both GEDmatch and FamilySearch, with no very useful results yet. These old New England matches can be very, very far back. It’s frustrating. I learned recently of a new site to upload your DNA results to (they don’t test directly). DNA.land is new, and I heard about it through various blogs (see Kitty Cooper’s post here and CeCe Moore’s here). I uploaded mom’s test, with her permission. I got no matches, although that’s not surprising. I will upload additional tests (each needs their own account) soon, unless I decide there’s really not much there. But I feel like this DNA stuff is in its infancy and I want to welcome players who have some agenda beyond simply making money. For instance, I now have a test for my husband. His family background is pretty cloudy. What surprised us was finding out that the hints he had gleaned over the years actually turned out to be true. His Mohegan ties in Connecticut, documented a bit elsewhere by others, are found in the trees of those he is connected to by DNA matches. His closest match happens to be in the Fowler line we were wondering about. Someone has done a surprising amount of work on my husband’s Fowler line on FindAGrave.com. There are copies of obituaries, pictures, and many notes. I wrote to him to thank him but never got a reply; my husband’s grandparents are not well documented so perhaps he doubted what I was telling him. Turns out, from DNA, it appears to be true. Perhaps I should write again! More so than any other genealogy avenue, DNA-related queries tends to elicit no response from so many people. Perhaps they tested for other reasons. Perhaps they know very little about their tree. I try to answer the questions I get, but I almost never answer the ones that are like this: “Hi I’m Denise and I saw we have a match. Can you help me I’m looking for my family.” What is missing from that question are the site they’re looking at, the identity of the test they’re matched to (I have 7 now), the size of the match so I don’t have to look it up, and any indication of what they know (even “I don’t know who my father is; I was born in the mid-1960’s in Maine” would be a huge improvement). And, more often than not, I have placed a tree on all sites, but obviously they have chosen not to look for that. But perhaps I am guilty, too. Onward into the brave new world of DNA testing, I guess! Since my previous report on my efforts to try DNA testing, a lot has happened. Here is an update. My mom and dad both took the Family Finder test. The results were interesting, but I began to realize that it would also be helpful to start having more relatives in the mix. Towards the end of 2014, Family Tree DNA started offering discount coupons on each account. Somehow I managed to purchase the Family Finder test as an add-on to my existing MtDNA test, instead of a new test kit – oops! I hadn’t even realized such a thing was possible. I wrote to them for help, and eventually got a reply, and after a phone conversation, we agreed on a partial refund. Which was nice, because it was mostly my own stupidity that caused this. My plan is to administer the test to another relative to help me distinguish the source of some of mom’s particular DNA. I have a peculiar lack of relatives on that side – mom had an identical twin (well that’s not so helpful, DNA-wise) and no other siblings, and only one first cousin. She had two second cousins who have recently passed away, one with no descendants. So, I think mom’s first cousin is able and willing, and I will pursue that question, now that my new kit is in hand. So now I have Family Finders for myself, Mom and Dad. It has been rather interesting to have results for all of us. There is far more data analysis available through Family Tree DNA than there is on Ancestry DNA, although the down side is there are far fewer trees to look at. When the results came into Family Tree DNA, I recognized some “old friends” from mom’s Ancestry DNA test. But now, I was able to do more with those matches. Family tree DNA allows you to do some analysis pretty easily. Here are some examples. Mom’s 9 closest matches. I’m on top. After months of looking things over and utilizing some tools in Family Tree DNA, I have learned some things about mom’s closest matches. Here are mom’s top matches. By default, the list sorts by size of largest block. But it also can be interesting to look at the total shared cM. #1 is me – we match very closely of course. Match #3 is someone I had corresponded with on Ancestry DNA and he is part of my Andrews connection. He told me about a match we share, which was mom’s #2 match. With some advice from #3 I approached #2 for more information – he has no tree or data on Family Tree DNA. I got a friendly response and a little data, which #2 expanded on – he had already begun researching this himself. I need to do my own research on #2 and this may lead me to answers for some of my Andrews questions. Match #9 is part of that group as well. Turn on Show Full View so I could see the Longest Block measurement, and “+ Compare in Chromosome Browser” for each match. When you click Show Full View, the Compare in Chromosome Browser choice shows up below each entry. In Common With shows up when you click the last of the four symbols below the name. From there, choose people to put into the Chromosome Browser. See if they match in the same place. Another choice is to use the Matrix feature (under My DNA — Family Finder — Matrix). By running those features I developed several groups of matches with a fair idea of where, approximately, they might match me or mom. Based on what I’ve been reading, I paid more attention to matches that both mom and I share, which is a good clue about non-random matches. So far, the groups have been interesting but only the Andrews one, noted in my first DNA post, seems definite. The other groups need to be explored more. It was match #7 that has been the biggest surprise. First of all, because Family Finder sorts the matches by largest block, it was a LONG time before I finally noticed that he was mom’s largest match by far at 112.97 cM. He matches me at approximately half that amount. A match of that size is likely to be, say, a second cousin 1x removed. A match of half that size is likely to be a third cousin. It looked like I had found someone who was a third cousin to me, and second cousin 1x removed to my mom. 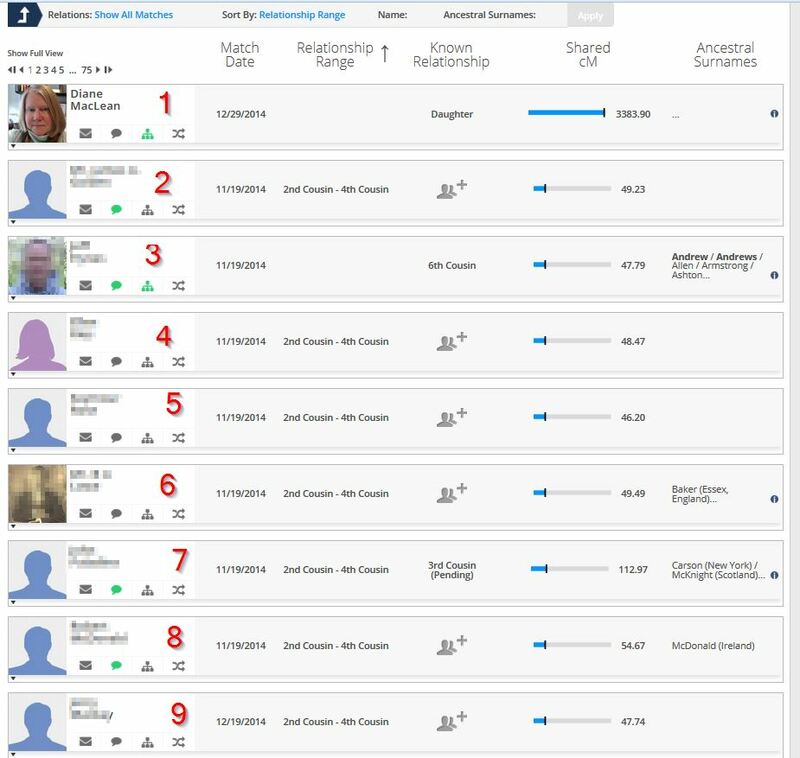 #7 offered very little in the way of names on the Family Tree DNA site. I wrote to him. We corresponded once or twice and he gave me some names and details of his grandparents. His paternal side was clearly not matching my family. On his maternal side, he mentioned some names and places that didn’t match what I had. He had a Martin, but from the wrong place. I began researching one side of his maternal line. What a fascinating, large family. I traced numerous great aunts and uncles, each story more intriguing than the last. I found pictures, court records, and newspaper items. Eventually, I found enough to reluctantly convince myself I was not related to those people. So I moved on. The other side had a Carson who married a Martin. There was some confusion about what the first name was. Using what I had, I began to research. One of the first things I found was a census record and suddenly, it all became clear, although it took me several days to gather additional evidence. I found Lillian (from Canada) and James (from Ireland) Carson living in Somerville, Massachusetts with their son in 1900. Also in the household was sister in law Hazel Martin, born March, 1885. I know who Hazel Martin was, in fact, I had saved the census record in my Shoebox on Ancestry years ago. Hazel Violet Martin was the younger sister of my great grandmother, who had died in 1897. In 1905 Hazel married Frederick Bamblett in Providence, Rhode Island, and she died in Detroit in 1907. My great grandmother Bessie had another sister, May, that I could never account for. She was listed in the census records before the family left Canada. She, for some reason, was a witness to Bessie’s first (unused) marriage license. She was the maid of honor at my great grandparents’ wedding. It was obvious that May must have been the author of “Teddy’s Book.” What I had never realized was that May Martin was really Lillian May Martin. 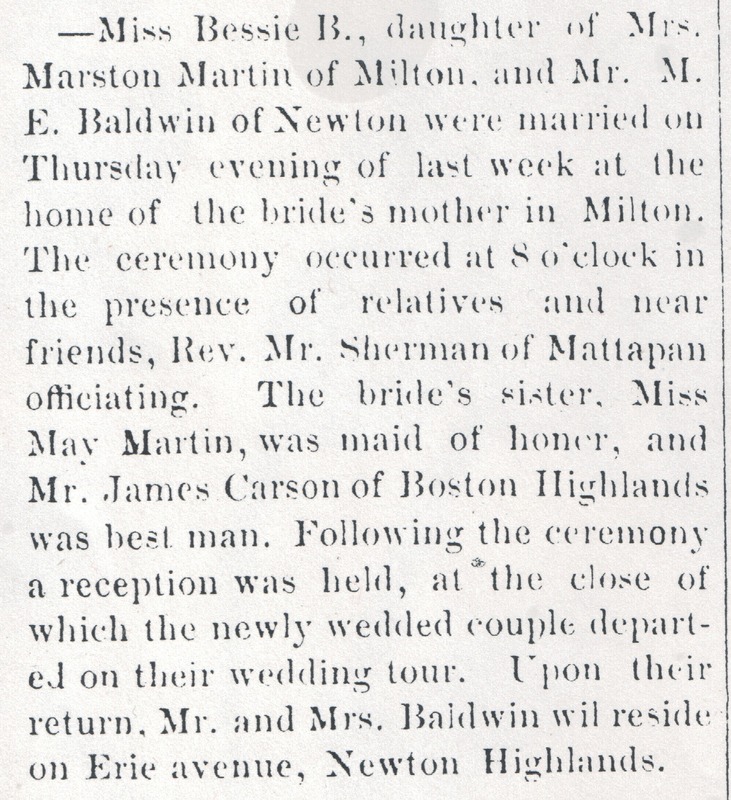 Marriage announcement of Bessie Blanche Martin, The Milton News/Dorchester Advertiser, vol. XII, No. 24, Saturday, Sept 10, 1892. From microfilm, Boston Public Library. As I went back to review what could be known about my grandparents’ wedding, I saw probably the most compelling clue: James Carson (Lillian May Martin’s husband) was the best man. I had never put the clue in the newspaper clipping together with the clue in the census record that was a possible match for sister Hazel. Evidentia would have solved this one, I think. I hadn’t used it on Bessie Martin. 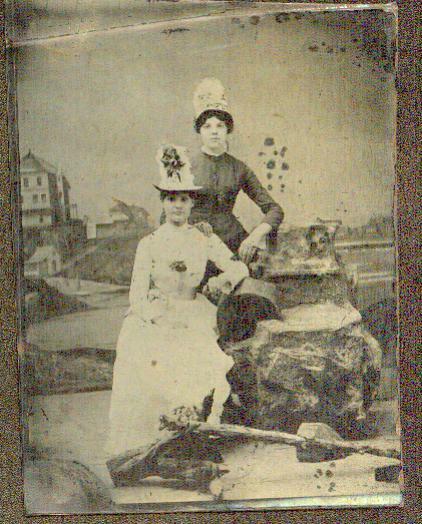 Bessie (in back) and sister Clara … hopefully having fun at a fair … unless those hats were the latest thing. My additional evidence is a bit garbled because of the inconsistency with which the siblings reported their parents as “Marston/John/Jonathan” and “Maria/Elizabeth.” I know this sounds incongruous, but these are the same people, and for some reason in the 1890’s the family sometimes went with the alternate versions (particularly, on my great grandmother’s death record). I have some evidence that they never really obtained any citizenship status, so maybe they had something to hide. Or it’s possible middle names were used at random (like Lillian May). I don’t know. 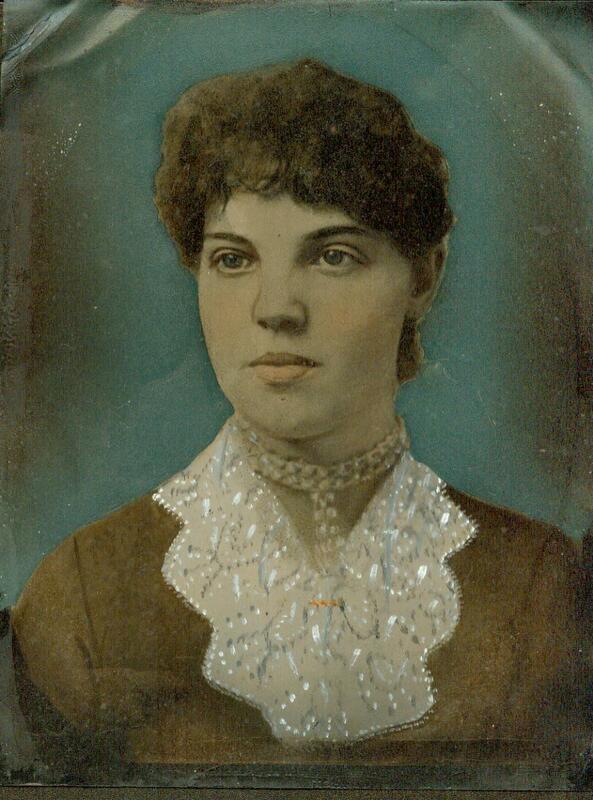 We knew almost nothing about my great-grandmother Bessie Blanche Martin (1870-1897) when I started genealogy. I chronicled her story here, here, here, and here (and don’t miss The Runaway Bride of Newton, Massachusetts). We had a tintype of her, a picture of her and her sister Clara, a picture of Clara holding a baby, and a tiny homemade album of scraps and quotes called “Teddy’s Book” which was clearly created by someone for my grandfather when he was a small child. From those clues one would suspect Clara had been the sister she was closest to, but as I learned more I realized that Clara married and moved away, and it must have been May, still home in Milton, Massachusetts, that was close to her sister when my Grandfather was small. My great grandmother died the day after giving birth to her second child, Blanchard “Jim” Baldwin. Cause of death was listed as cancer of the stomach. One has to picture the illness and pregnancy as a sad and difficult time, assuming this was known. My great grandfather, Miles E. Baldwin, quickly married again. But in the pages of “Teddy’s Book,” written for my grandfather when he was about 5, around 1898 (shortly before the family left Newton) we get a glimpse of a Teddy’s doting and attentive aunts, obviously constant visitors at the Baldwin household both before and after the death of Bessie. 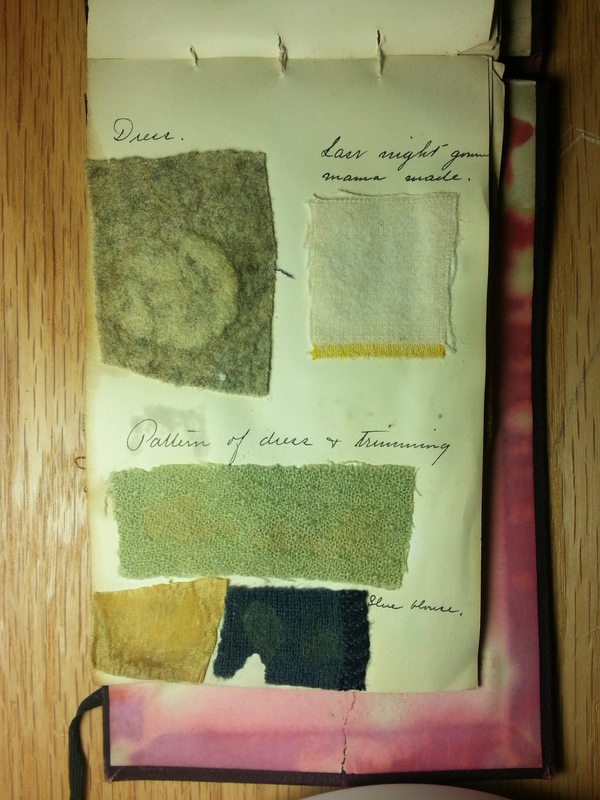 They clearly adored their nephew, to the point of making a little scrap book filled with his “sayings” as well as snippets of his mother’s clothes. They spoke kindly of the new wife, either because they genuinely liked her or perhaps for the sake of their nephew … in either case, it was a loving, supportive gesture. Things did not go all that easily for my grandfather once his family moved out of town and he went on without his mother and the loving aunts. I imagine he felt that loss, unknowingly, for the rest of his life. Lillian May’s life was difficult, filled with loss in the succeeding years. The author of the sweet and charming book, a happy fiance and, later, wife, also fared rather badly as life went on. The DNA match filled in a story that I half knew, and, I hope, helped both sets of descendants get a glimpse of happier times. 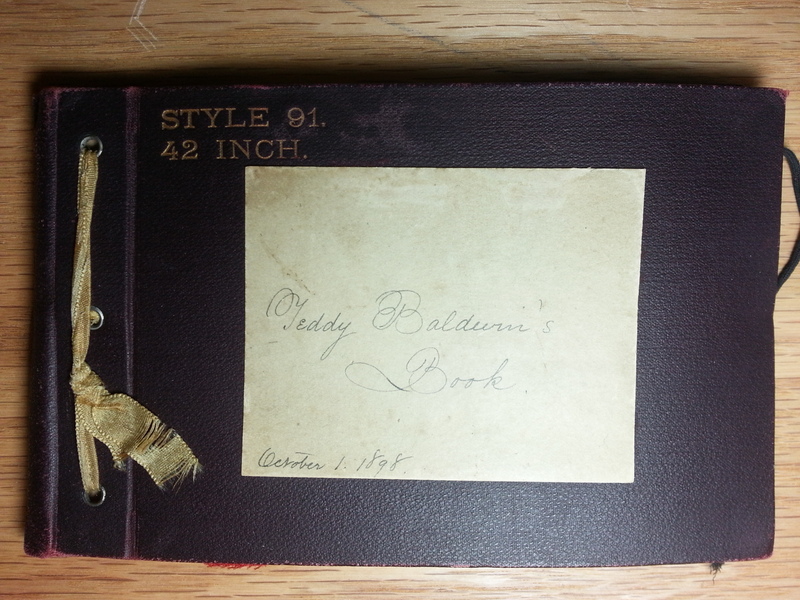 I have recorded the full contents of “Teddy Baldwin’s Book” as a pdf HERE for them to see. 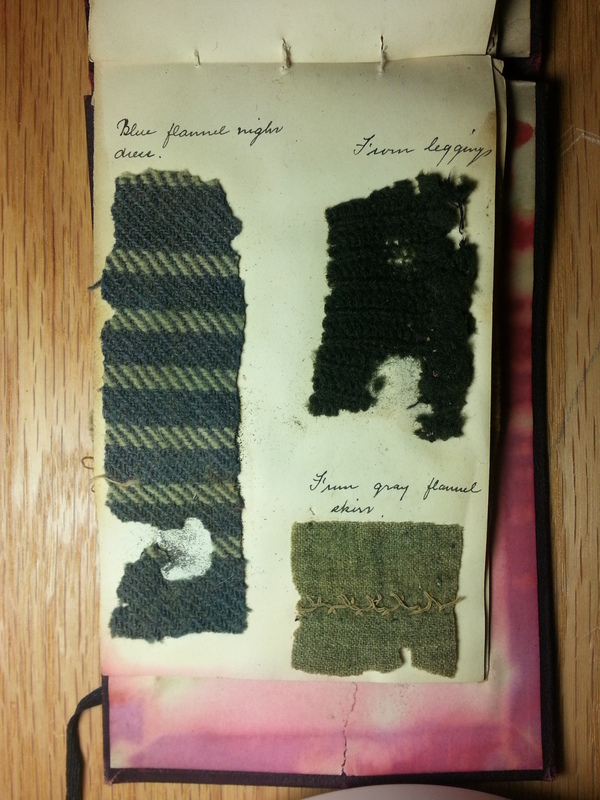 “From gray flannel skirt” – perhaps that is Bessie’s stitching. I had put this information together in December, and on Christmas Eve morning, sent it to my third cousin, supposing that if he saw his family he would pass it on. I got a very nice reply from his mother, and corresponded with her a bit. I am glad to have met them – and in fact, I have “met” online some of Clara’s descendants, too – and it seems good to put some pieces back together, even in such a small way, of what was obviously once a supportive family group. Later in February, I am going to meet another second cousin on my father’s side. She emailed me a picture which was a big hit with my family. I didn’t exactly start DNA to connect with cousins, but it has been rather amazing to do so. SO MUCH to learn with DNA, and it’s slow. I don’t know Roberta J. Estes, author of the DNA eXplained blog, but she appears to be some kind of genius. Her work at dna-explained.com is extensive, well written and really illuminating. I have been involved in four tests. many of our fellow test-takers seem to have some mystery in their direct male line, and their known first ancestor is more recent in time than James Anderson. Anderson is a common, and I mean common, name. There is an Anderson project, so that’s good, but we can’t make much out of our matches there. We do not have a lot of close matches, only one Anderson and a few Dagliesh/Douglas families. I am glad we have this test recorded, but I think we need to try some other strategies. This is a test of the kind of DNA that goes from a woman to her children, but only can be passed on again by her daughters, not her sons, so over a long period of time is transmitted through a direct female line. I took this test because my direct maternal line does present a problem. My grandmother’s grandmother Jessie MacLeod Murdock came to Rhode Island from Pictou, Nova Scotia, but her background before that is murky, particularly regarding her mother, Rachel (last name unknown). I thought if I could at least find out about Rachel’s origins that might help me. Louis and Jessie Murdock in 1933 on the occasion of their 50th wedding anniversary, (Jessie short, in the center) with their three daughters, the husbands, three grandchildren and twin great-grand-daughters, my mom and her sister. many of the testers who showed up in the list knew very little about their maternal family tree or submitted no tree at all or seemed not to understand that for this test, most distant direct maternal ancestor should be listed, not the overall most distant ancestor. Of the matches where I COULD see direct maternal info, I was surprised at the wide range of origins. Germany, England, Russia, Ireland, Holland, and early U.S. settlers were represented. Doesn’t clarify things much. Clearly, we have some kind of strong MtDNA which has not changed in hundreds or should I say thousands of years. So all in all, no help for me here although I suppose I have ruled out Native American origins, which were a possibility. Autosomal DNA is the bulk of one’s DNA, some of it being acquired from the mother, and some from the father. This test was of my father’s autosomal DNA. Of all the tests, this one definitely led to the closest cousins. My father’s grandparents, Torquil and Sarah MacLean, had 11 children and dozens of grandchildren. So of course I have many second cousins in this line, and my father’s test matched with one of them, a woman about my age in Utah. I hope to get to meet her someday. 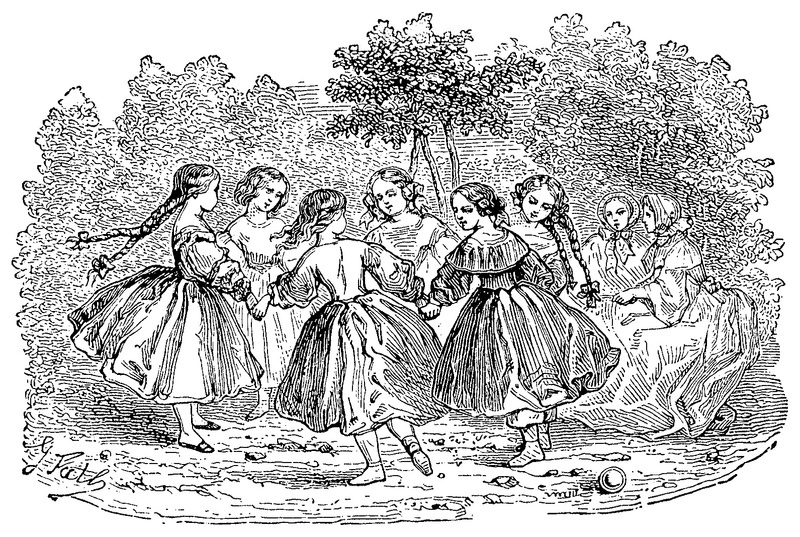 There were many other third and fourth cousins, with names and locations familiar to me from my father’s Cape Breton family tree, although currently most of the descendants are living all over Canada and the U.S.
My father’s four grandparents were from Cape Breton, Nova Scotia, with Scottish origins in the Lewis and Harris regions on the western islands. So I was a little taken aback, at first, to see Dad’s ancestry come up as 54% Ireland and 41% Great Britain. But on closer inspection, I could see Scotland is included in those two designations. Looking at the shapes on the map, BOTH locations covered portions of Scotland, with the north western islands of Scotland representing the most remote coverage of each area. So it made sense; it easily could represent his Scottish roots. 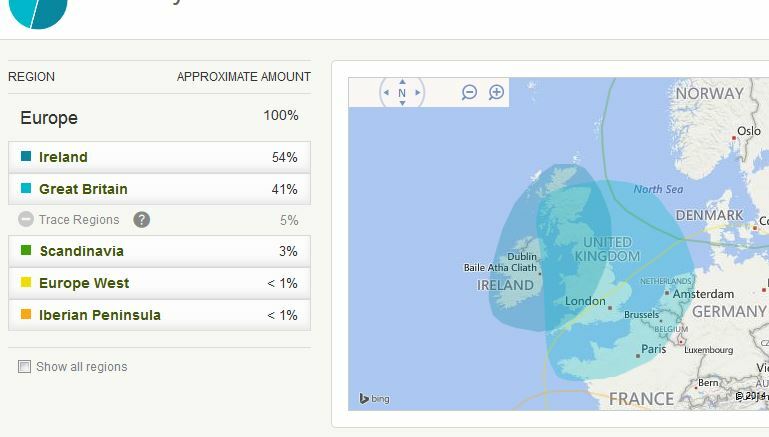 Dad’s ethnicity report from Ancestry DNA show that his two main areas – Ireland and Great Britain – both include Scotland. No big surprise there. Graphic from Ancestry DNA. My first surprise with Ancestry DNA is that when they alerted me that results were in, and I looked, there was almost nothing there. Oh well, I thought, that’s not so good. But surprisingly, a few days later I looked again and there was far more to see. And then I looked again two days after that, and there was even more. Apparently, the data must be present for a while before the matching starts to show. Mom was 99% European, mostly British with some Irish, but I suppose some of the British/Irish originates in Scotland. This is where we shout from the rooftops that DNA testing is better than dusty old archives any day (with apologies to dusty old archives, who were my first love). Once mom’s results really started rolling in, I saw close matches with ties to the Andrews, Sweet, and Matteson families of North Kingstown/East Greenwich/Warwick, Rhode Island. Two of the matches actually showed up as third cousins, I am guessing because they, and my mom, had multiple ties to those families (I have heard that multiple lines of descent can exaggerate the closeness of the genetic link between two people). Genealogy happy dance. Evidence (but not proof, at this point) that my Andrews family IS the same as the Jesse Andrews and Sally Arnold who married in Warwick in 1795. More on this to come. [Andrews], Jesse, of Phillip, and Sally Arnold, of Joseph; m. by James Jerrauld, Justice, Feb 22, 1795. Other “matched” people at the fourth cousin level showed up pretty clearly in other spots on my tree, and it felt GREAT to see some scientific evidence backing up my carefully-grown family trees. And as I keep thinking about it, clearly I can keep scouring the many matches that turned up for links to other problem areas. This will take a lot more work to really figure out, and as I start to think this through I realize it will take a new way of researching. Usually, ANY connection is a clue to be followed up on, but with DNA, only a direct link between generations will produce the matches I am seeing. It’s a new way to approach research, and everything that comes next is really a new road for me. A lot to learn. My goal is to prove that those matches did not come from some other connection. Meanwhile, I talked two very nice fifth cousins descended from mom’s Nova Scotia ancestors into taking some extra tests I had. If they are related to my mom, both would be rather significant for me since they come from branches where I’m not sure if there was an adoption, or not. A bit of matching wouldn’t tell me exactly what I need to know, but could encourage me to keep looking. I uploaded results to the free site GEDMatch.com, to see what additional matches I might find, and to try some of their other utilities, to get more from my results. More to come on that. Mom and Dad do not appear to be related to each other. There was a possibility, since they both descend from MacLeods of Nova Scotia/Scotland, but GEDMatch did not find genetic ties. I would like to begin a systematic testing of my parents and other relatives on the Family Tree DNA Family Finder test. That test allows you to pinpoint the specific DNA sections that match other people. I am hoping a sale comes up soon. This may end up including my Y-DNA testing cousins.